​Penny Madden is an English qualified Queen’s Counsel and partner in the London office of Gibson, Dunn & Crutcher. 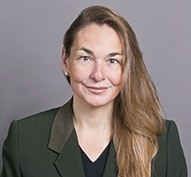 She is Co-Chair of the International Arbitration Practice Group and a member of the firm’s transnational Dispute Resolution Practice Group. She has a wide range of experience in all key aspects of international arbitration with particular expertise in shareholder, telecommunications, SPA, energy, international trade and insurance disputes. She represents clients across the globe in a wide variety of arbitration proceedings, including those before the London Court of International Arbitration (LCIA), International Chamber of Commerce (ICC), United Nations Commission on International Trade Law (UNCITRAL), International Centre for Settlement of Investment Disputes (ICSID), Permanent Court of Arbitration in The Hague (PCA) Singapore International Arbitration Centre (SIAC), Hong Kong International Arbitration Centre (HKIAC) and London Maritime Arbitrators Association (LMAA), as well as in ad hoc proceedings. In addition to representing clients as counsel and advocate, Ms. Madden regularly sits as an arbitrator. Ms Madden also has significant experience in high court litigation, enforcement proceedings and regulatory investigations, and frequently advises European companies registered in the United Kingdom and/or the United States on complex multi-jurisdictional regulatory enforcement issues. Her recent cases include representing a telecommunications corporate in its US$17 billion dollar UNCITRAL investment treaty arbitration against a North African state; representing a major mining corporate in a US $1.4 billion LCIA arbitration dispute; representing a North African Sovereign Wealth Fund in multi-million dollar ICC arbitration proceedings against a global hospitality corporate; representing a global corporate in its US$1.6 billion dollar ICSID investment treaty arbitration against a sovereign state; and representing shareholders in a major oil company with respect to multibillion dollar claims for expropriation under the Energy Charter Treaty. She is a member of the LCIA, CIArb, the Financial Sector Arbitration Group and the editorial board of Commercial Dispute Resolution. She writes and lectures on a wide variety of arbitration issues and is the international arbitration specialist for the Diplomatic Book and Website for foreign Embassies and High Commissions. Ms. Madden is recommended for International Arbitration in Legal 500 UK 2019, Chambers UK and Chambers Global 2019, which recommends Ms. Madden as a leading lawyer for International Arbitration and describes her as a “strong advocate” who clients consider to be “extremely hard-working”. She has also been described as “very business-oriented” with “great analytical skills” and “always available for her clients.” Best Lawyers International 2019 recommends Ms. Madden in the field of International Arbitration. Ms. Madden received her Bachelor of Arts in 1990 from University of Oxford, St. Hugh’s College, and her Law Society Finals in 1992 from University of Law, Guildford. She took silk in 2016.